At an early stage of the formation of the group, a mutual and reciprocal interdependence between all the group members, both as a whole and individually, is established on all levels of interpersonal relationships. This interdependence is even stronger if the group leader refrains from assuming the leadership functions urged upon him by the participants and instead confines himself to the role of expert adviser, a role to be described more fully later. In this manner, a definite interaction of budding relationships comes to play within the group all of which find their meeting point unmistakably in the subconscious. Moreno calls this phenomenon a “tele,” a concept which he termed, in analogy to empathy, a “dy-empathy” (Einfühlung <-> Zeifühlung). The various egos of the participants meet within the group in their emotions and their urges. It is within this network that the ego can enter the contestations and can achieve the conscious control of the individual’s potential and the working through of its instinctual drives. The instinctuality of the group as a whole is to be worked through in the course of the group therapy in exactly the same way and to the same extent as the instinctuality of each of the group members, for Freud’s postulate that the id is to be transformed into the ego indeed holds true just as much for the group as for its individual members. It is within this meaning that the formation of relationships with the byproducts of transference, countertransference, and resistance is experienced within the group. The acquisition of conscious perception leads to catharsis, to the cleansing and elimination of affect impulses, to control by means of reality testing of the whole world of living and dead things, the control of all objects, in the widest sense, with which man has to deal consciously. This recognition fosters the growth of self-awareness—the realization of our true potential and of our actionable fulfillment. Possibilities are thereby discovered of how to work together towards common goals and, thus, to assist each other, helping each other in the perception of the object world and, by the same token, in the reality testing through which a constant check of the ego development becomes possible. The actogram records in intervals of five minutes (or more frequently, if so desired) the manner in which the various participants in a group react to each other and what subgroups are being formed. The sociogram records the sequence of the group conversations, which is subsequently supplemented by the use of a tape recorder and appropriate transcripts. 1. White; 2. Bloom; 3. Smith; etc., which means that 1 sits next to 2, 2 next to 3, etc. Since by preference we seat our participants in a circle, even a spontaneous selection of seats results not only in neighbors but also in persons facing each other across the circle. If at all possible, we wait until one of the participants speaks up. The tape recorder then records the voices and all the background noises while we merely note the sequence of the speakers: 1, 3, 9, 2, 9, 2, 9, 4. 1 starts the conversation, 3 replies to 1, 9 continues the conversation, and so on, and the tape later reveals what is being said by each one. Moreover, we encode the attitudes of the participants according to the following categories: proposals; opinions; assent; disagreement; messages; instructions; friendly approach; hostile approach; neutral approach; ambivalent approach; tension; detente; distraction; solidarity; aggressivity; question, skepticism, doubt. These symbols are necessary since communication often takes place without verbalization and merely by attitude, gestures and facial expressions. Verbal communications can be recorded by noting key words and, in addition, are recorded on tape. Even when dealing with highly active or playacting groups, or with psychodramas, actograms recorded at intervals of five minutes are usually quite satisfactory. Technique and Practical Examples1. In the technique of group psychotherapy it is always useful to use two or three assistants, of which one or two can serve as “auxiliary participants” who are to remain silent at the beginning of the sessions but are sufficiently in harmony with the group so as to be able, if necessary, to act as “auxiliary egos.” In addition, each group should have a nonparticipating recording secretary. Indeed, the scrutiny and analysis of the recordings of the group sessions over a period of weeks and months will show very clearly the development of the individual group members. It also will allow for the determination of prognoses and will yield important therapeutic clues. Following a suggestion of Moreno, we establish an actogram as a graphic representation of the actions taking place during a given group therapy. This actogram facilitates the sociographic and dynamic control of the group and also shows up all radically disturbing influences. The three actograms reproduced here as examples illustrate three stages in the development of a group of difficult, institutionalized adolescents engaged in psychodrama (Figures 1, 2, 3). These show how the participants react to each other in space motility at intervals of five minutes. Ludwig shows up as a withdrawn member within the group; he is underendowed but physically relatively well developed. He is sensitive but shields himself well. Thus, he selects instinctively for himself roles in the psychodrama that are dehumanized or inanimate—ones confined to uncomplicated actions and not calling for subtle verbalizations or sophisticated acting, such as the roles of dog, horse, ship, or water. In the first actogram we can see that the whole group is relatively well integrated and engaged in harmonious interplay. Ludwig markedly holds back but nevertheless participates in the group activities. In the second actogram he has relinquished all his reserve and is very active within the group while, in the third actogram, he suddenly withdraws completely. What has happened? Ludwig meanwhile had been granted two weeks home leave with his parents, who, dazzled by the good emotional development of their boy, had tried—without our knowledge—to enroll poor Ludwig, during that time and on a trial basis, in a school of higher learning. There, the boy found himself suddenly in competition with boys of his own age who, however, were intellectually much better endowed than he, and where he soon became the scapegoat of the class, a typical situation of poorly endowed children who find themselves in normal school situations. Ludwig remained in the role of the scapegoat even in the following group sessions, where he became the wallflower; and it took him some time to reintegrate himself into the group in which, previously, he had already felt quite at home. This case illustrates not only the value of the actogram but also the responsibility incumbent on the group psychotherapist who has to be familiar with the special case of each participant, must be able to follow their day-by-day development, and needs to grasp fully their individual traits so as to recognize when a patient has to be switched from group treatment to individual therapy and what specific form of therapy is then best indicated. As we have already stressed, group psychotherapy, as a matter of basic principle, never must exclude the possibility of individual treatment and, conversely, there is no reason why one should not consider an individual patient for inclusion in a therapy group. In this way it will be possible to reach true psychic depths even in group ‘work, always provided that the therapist is not only qualified to engage in individual therapy but also has sufficient time to do so. Any clinical treatment, by its very nature, has as its ultimate goal the cure and the release of the patient. In group therapy, this leads to certain bonds and transferences which call for a number of different solutions in accordance with the nature of the institution. Generally speaking, we always try to assemble our group patients from a single ward, since this facilitates the manipulation of the “visitors’ group.” There are some, however, who prefer to select their group participants from various departments; in this respect, it will always be best to follow local usage. Where the changeover is sufficiently great, those patients ready to be released can be removed all the more easily from the initial therapy group. With chronic cases, it was found advisable to transfer patients occasionally from their original therapy group to a new mixed group composed of clinical and policlinical patients and supervised, until the dissolution of the group, by a physician familiar with the cases in the respective wards but not exclusively assigned to them. The best follow-up results were obtained with patients who could be regarded as socially readjusted and who were able to dissociate themselves completely from the clinical community. If policlinical or social supervision was still required, it was found preferable to form a new group exclusively composed of outpatients, an indication confirmed especially by the experiences made with groups of alcoholics, such as those maintained by welfare organizations for alcoholics and by Alcoholics Anonymous. We have also had some experiences in dividing individual and group therapies among several therapists, but such a working method is only feasible if the therapists themselves function well as a group in which perfectly equitable human and professional relations are safeguarded and in which expressions of aggressivity, touchiness, neurotic complexes, narcissistic urges, and professional jealousy are under control. Last but not least, the therapist must be able at all times to control analytically not only the actogram but also the sociogram of the group. Thus, the actogram alone may often reveal to the experienced therapist the moment when it may become advisable to shift within the group the key figure, the performer, the wallflower, with their respective counterparts, their followers, or their acolytes. Often the need arises in a therapy group to dissolve certain pathological attitudes that have become “patterned” and fossilized. It then becomes the task of the group leader to guide the group situation so that the individual participant may realize his own psychic plasticity to the full extent of his potential and may thus mature into a truly responsible, reality-adapted personality. The answer to the question as to how a therapeutic group is to be selected in a clinic and how often such a group is to meet, depends on various circumstances. As we have stressed repeatedly, every ward visit should be structured so as to be fruitful from the viewpoint of group psychotherapy. This does not require, according to our own experience, that all these visits be extended over long periods of time, but it is nevertheless important that the therapist be able to devote approximately one half-hour each morning and each afternoon to a group numbering fifteen to twenty patients. Special groups are to be formed according to needs and possibilities. Thus, in the days of insulin treatment, we used to spend the whole morning assisting during the entire length of the insulin therapy—to the extent that this was feasible—in actual cooperation with the patients and nurses. Indeed, the presence of the physician imparts to the insulin group a very special feeling of comfort and security, which results in an analytically highly profitable situation and one in which the therapist is actually about to share with the patient the regressive periods before and after the insulin coma, as well as the death experience of the coma itself. Thus, he comes to represent for the patient a true protector, the comforting mother, as well as a father image. So that the full benefits of this particular situation may be reaped, the insulin treatment physician optimally should be the therapist. In connection with the group therapy, very significant insights can thus be gained during the patient’s sinking into the insulin coma and during his reawakening, which later, in individual analysis, provide a sound basis for the working through of the patient’s anxieties and, more particularly, of his isolation in the coma experience. Together with Mumbert, we reported on these findings in 1957. The detailed scrutiny of our therapeutic records allows us not only to classify the various attitudes according to their contents and their sequence but, in addition, has given us important indices for the elucidation of group dynamics, and it is specifically these that shall now be discussed. The confrontations of the various individuals with and within the group are as manifold in their nature as the manifestations of human life itself. Nevertheless, a basic underlying principle can be found in this diversity which may now be schematized in the form of a quadrangle illustrating the parallelogram of forces active within a group. Several group theorists, Teirich and principally Schindler among others, have followed therein the findings established in animal psychology: they postulate the alpha-type as the dominant group member to which all the other types, down to the omega-type as the lowest one, are subordinated. But man has at his disposal physical and psychic means of adaptation that are not available to other living organisms. This is not only demonstrated biologically by the fact that man manages to survive in all the zones of the earth, from the poles to the equator; and that he has been able to adapt to such radically different environments as air and water, the depths of the earth, the heights of the atmosphere and even deep space; it is demonstrated also and foremost by the elasticity of his psychic structure, which is adaptable to the most diverse living conditions and the most variegated social requirements. In establishing our theoretical foundation, we shall seek our basis in the arch group formed between the mother and the human offspring. Let us formulate the underlying principle in the terms of a slogan: In the beginning, was aggression. In doing so we need be mindful, however, of the fact that originally aggression is not necessarily synonymous with hostility; essentially, it merely means an approach, a meeting and a getting together. It is only the nature in which this meeting is then resolved by individuals which determines whether it culminates either in the most intense union, a union resulting in new life and companionship, or in destruction, hostility, and hatred. This realization was espoused five centuries before Christ by Empedocles when he postulated that love and hatred are the basic forces of life, a formulation that was taken up by Freud himself in his later years when he identified the two basic and opposing drives in man as the wish to survival and the death wish, the philia and the neikos, both forevermore locked in destructive struggle. Biologically speaking, all life is generated by this aggression. It is the aggressiveness of the sperm cell inseminating the egg cell. And it is this inseminated egg cell which, in union with the body of the mother, fashions the new life of the offspring. Therefore, the fundamental significance of the group lies indeed in the creation of this duality, the confrontation in the dyad of that which is being formed with that which exists already. Something new is gaining shape in something that already has shape. The more that which is being shaped achieves individual form, the more it conflicts with that which already has its own form. Thus, the first confrontation in human life takes place between the mother, the already fully formed being, and the child whose form is only beginning to emerge. Birth then brings about the natural solution and dissolution of this confrontation, but the psychic unity between the two remains for the time being in the dyad. The child, at that moment, begins to experience the outside world, hence the group of which the mother is part; but it experiences it only through the mother. Gradually the mother herself becomes part of the outside world, a part of the group surrounding the child who then becomes increasingly independent in its being. A system of interrelations develops which, though more or less stable, cannot remain static. A static condition would not correspond to life, for life means development, which means change. Development is always dynamic and therefore involves the interplay of opposing forces. Within the arch group of mother and child, this interplay of forces finds its expression in the confrontations imposed by the growth, the development and the adaptation process of the child to the outside world. In this confrontation the mother initially is always aware, without consciously knowing it, of the various needs of her infantile group partner. Within the maternal womb these needs are regulated and satisfied “hormonally.” There exists a regulatory balance between the growth and development potential of the embryo and the growth and development needs for which the embryo requires fulfillment from the maternal organism. The more the infantile organism gains in independence and individuality, the stronger will be his claims for the fulfillment of his needs while, at the same time, the ability of the maternal organism to fulfill these will decrease proportionally. There then ensues the ejection of the offspring, the birth of a being which, while helpless at first, is nevertheless endowed with the full life potential of an individual. The dependence of this independent being is still, for the time being, unconsciously taken into full account by the maternal partner. The instinctual group relations continue to function. The child has needs, which are satisfied by the mother as the key figure. The awareness and the fulfillment of these infantile needs by the mother even goes so far that, during that period, the mother largely renounces any contact with other group members in the society in which she lives. But as the independence of the offspring increases, these infantile needs upon the key person soon begin to exceed the ability of the mother to fulfill them. Increasingly, the mother is compelled to satisfy also the societal claims of her environment (such as those of husband, older siblings, or possibly even new offspring). Insofar as the child can resolve these denial experiences, these will lead it to assert its independence and to establish additional group relations. The natural group in which mother and child find themselves is the family. As we already know, the development of the family brings about typical group confrontations. The father has to relegate his own claims on the key figure of the mother when a new being takes shape within the maternal organism. The dyad of the young couple is being expanded into a triad and a significant part of the mother is being denied to the father. How the relations between the spouses adapt to these new circumstances will depend largely on the nature of the relationship established between the parental partners. Quite often the paternal counterpart is unable to resolve adequately the disappointment felt at no longer being alone in his claims on the partner in view of the burgeoning new life. The partner has become the key person for the expected child; the ability to fulfill the claims of the husband to the extent that this was possible as long as the mother’s womb did not harbor a new being, substantially decreases. This frequently arouses jealous impulses which in the dethroned key partner—the father, who thus has turned into an antagonist—may readily evoke experiences that he himself suffered as a frustrated child or sibling. In other words, reactions are triggered which can deteriorate into hostile feelings and may, in time, impair the matrimonial harmony and, lastly, the very fiber of the family. If, however, both partners are conscious of their common goal, it then becomes possible for both to act as may be expected in a truly mature marriage relationship: both strive to the extent of their own potential to achieve the optimal well-being of the growing family and again join at those points where they can complement each other without detracting through jealous impulses from the harmony of the triad. When the family is further enlarged—always conforming to the schematic analogy originally suggested—a situation develops in which, at any given moment, the oldest child is displaced by the later born from the focus of immediate attention of the mother. If the paternal partner, at this point, is not capable of asserting his group role as a harmonizing factor, the older children risk being dislodged from their places in the family core and of being relegated, instead, to the role of passive supernumeraries. Seemingly, they no longer voice any claims of their own and assume within the tetrad the role of wallflowers, like those perennially rejected girls who are never asked to dance at a party. Their bonds with the original group become untied, they begin to float, and, if insufficient claims are made upon them by their counterparts in the group, they seek out other partners. This loosening of original ties, in its psychohygienic consequences, embodies a decisive opportunity for the determination of one’s own life. For if we were anchored within the family as immovable parts and counterparts, the very survival of the family would become endangered through fossilization. As psychotherapists we are all too familiar with those severe interpersonal difficulties, at times leading to total unfitness for matrimonial relations on the part of the patients, which occur when the ties to parents and siblings have hardened into an insoluble union in which two partners in a family group become entwined so inextricably that they are no longer receptive to any additional emotional claim. 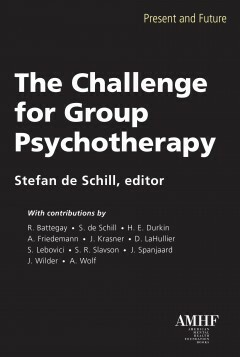 As every expert knows from experience, patients afflicted by such interlocked involvements frequently disrupt the homogeneity of a group and its therapeutic potential—a threat which, if not recognized and checked in due time by the therapist, may well place into jeopardy the continued functioning of the group. We have started out with the family as the archgroup. But we discern in the development of this archgroup a dynamic pattern which is repeated in the formation of all human groups. In this pattern, schematically shown below, K represents the key personality. This key personality—who is not in all cases necessarily identical with the mother—collects around it a group of dependents (D). This key personality is unable to fulfill all the claims formulated by these dependents, an inability that leads to frustrations. A number of dependents thus are relegated to the background of the group as mere followers (F). In their disappointment, they either directly approach the counterpart (C), of the key personality (K), who may be able to satisfy their claims more fully, or seek participation sooner or later in other groups. While the emotional potentials of these followers thus become free to combine, if the opportunity arises —either anew with the key personality or with its counterpart, or even with both—they dispose also of the additional alternative of entering new group formations. The opportunities afforded within the potential of this group pattern is of fateful importance to the individual group members: if the key personality is able to establish with its counterpart a fully integrated group relation, the life principle, that is the eros, the philia, will succeed in holding the group together. The dependents are given the opportunity to fulfill their unsatisfied claims with the counterpart. Inversely, the counterpart is able to liberate those group members who no longer are in need of the group, or he can attend more specifically to those members, who, reduced to the role of wallflowers, no longer dare voice their claims. Key personality and counterpart therein find an opportunity not only to take a helping hand themselves in the development of the group but also to call upon experts, both from within or from outside the group. What counts in the selection of the expert is his intimate knowledge and his controlled understanding of the prevailing group situations. Therefore, the leader of the psychotherapeutic group not only must be well familiar with the dynamics and the background of the group but also should have achieved full realization of his own self. The same standards apply in this respect as those governing the work qualifications of the psychoanalyst. For each and every human being it is generally true that group development and group guidance are all the more successful the better the expert is qualified and the more efficient he is in fulfilling his role as group leader. He requires insight, self-discipline, knowledge, and the ability to resolve the phenomena of transference and countertransference, as well as those of the various defense mechanisms. But the superior therapist, in addition, will discharge his functions in the manner recommended to the good analyst by Meng, namely, with that delicacy which any truly humane relationship requires, with the understanding empathy without which no true human contact is possible, and by always safeguarding that distance which is dictated by the respect for the fellow human being and his personal life history. If we add to this the conscious realization of being, all of us, subject—in the words of Freud—to the constant reiteration of life and death, then the resulting improvement within the group dynamics, in the control of libido and destrudo, of philia and neikos, of the ups and downs of psychic tides, will surely allow also for a better development of the group. Federn, P. (1956), Ich-Psychologie und die Psychosen. Bern Stuttgart: Hans Huber. Friedemann, A. (1959), Gruppenpsychiatrie. In: Handbuch der Neurosenlehre, ed. von Frankl, V. Gabsattel, and J. H. Schultz. Munich and Berlin: Verlag Urban & Schwarzenberg, pp. 357-360.